Elk Mountain PA, Carbondale, Lodging, Restaurant, Tavern, with Skiing, Golf, Mountain Biking Nearby! Casual Restaurant & Tavern Atmosphere, with Spotless, Renovated Motel! Orazzi's offers lodging in a hotel / motel setting for Carbondale, Union Dale, Forest City, Clifford, Jermyn and Mayfield Pennsylvania: We're cozy, clean, & affordable for families, business travelers, funeral bereavement, weddings, & skiers at Elk Mountain. Orazzi's Restaurant & Tavern makes certain you're well feed with great food and warm conversation. Celebrating 75 years in 2008/2009! 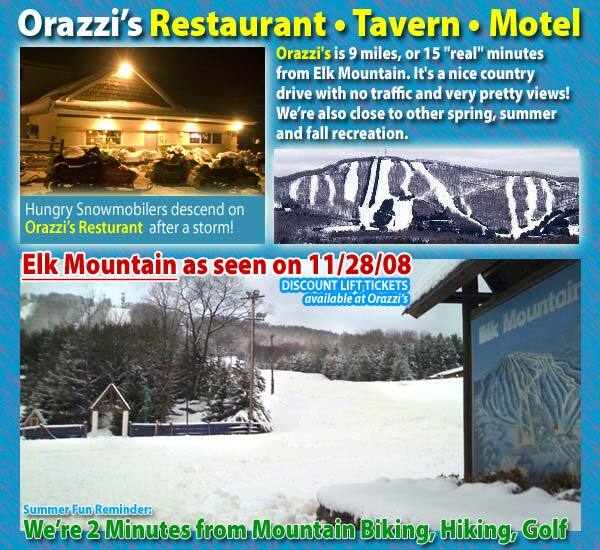 Orazzi's Now Offers DISCOUNT ELK MOUNTAIN LIFT TICKETS. WiFi wireless Internet now included with all hotel rooms and with dining room food purchase. This is fast, stable internet. Bring your laptop. Ski Elk Mountain, and get some work done too! Orazzi's welcomes Team Connecticut to the Hotel • Best of luck and thanks for your patronage! Marcellus Shale Natural Gas Employees we have great motel lodging, food and spirits.